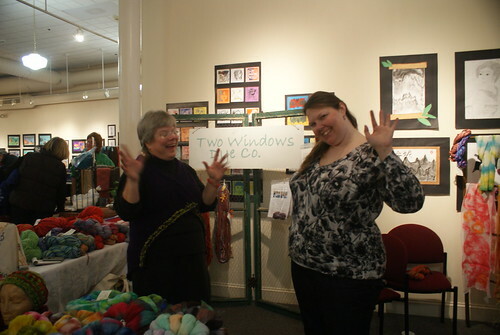 Winter Woolfest was great fun again this year! 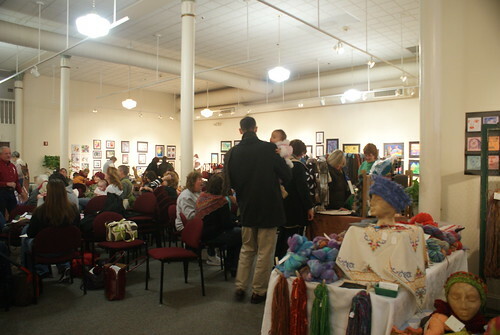 Thanks to the lovely & charming Jennifer Schermerhorn of The Wicked Stitch for putting this great event together another year! 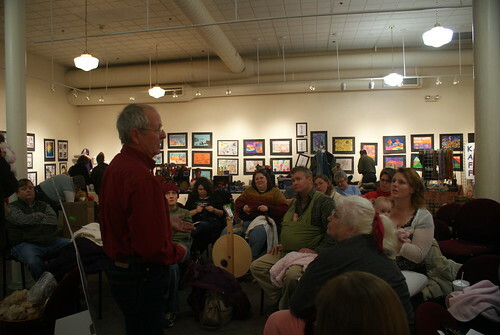 This year, we were at the Columbian Theater, so we had lots of room to spread out. There was even a separate classroom space upstairs, so we could have two consecutive classes, with no shouting! I gave a demonstration of carding various types of batts. I made a basic fleece, layered stripes, reblending a striped batt (two of the ladies in the group spun up samples of the striped vs. blended–dramatically different, and I’ll show them off when I find the spindles! 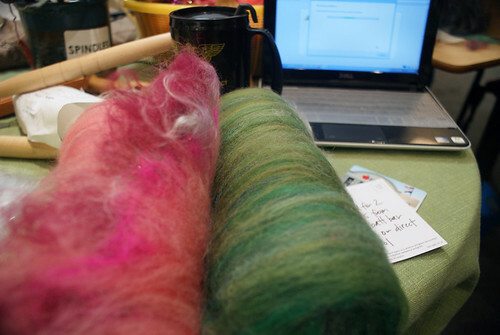 ), a tweed batt, a kitchen sink batt, and a dized roving. 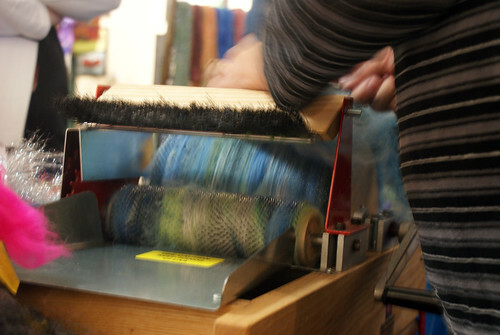 There were all kinds of FREE knitting and spinning classes all day: drop spindling, different cast-ons, cabling w/o cable needles, the magic cast-on, double knitting, alpaca care, stranded knitting, and a top-down heel without pickups (I’m taking that next year if it’s offered again!). I had my DIY Batt Bar set up again. I always LOVE the batts people produce! I only brought one carder this year, but next year, I’ll figure out a way to have two again. Maybe I’ll bring the table and carder to Jennifer’s early (it’s hard fitting all that crap in a Prius). I got a couple shots of my booth but neglected to photograph my newest display system, the converted drying racks! I made fabric slings for my cheap wooden drying racks to turn them into little shelved bins. It was rather ingenious, if I do say so myself. If I do the KAWS thing this spring, I’ll be sure to get some shots. My little goodies cubbies were there in the back corner. 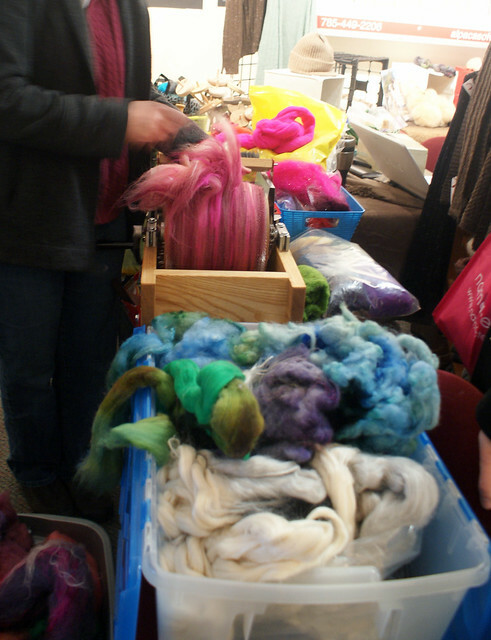 They held 3 types of sparkle, plus marvelous dyed kid mohair locks and angora fluff, and 3 types of recycled silk (sari, thown & banana). 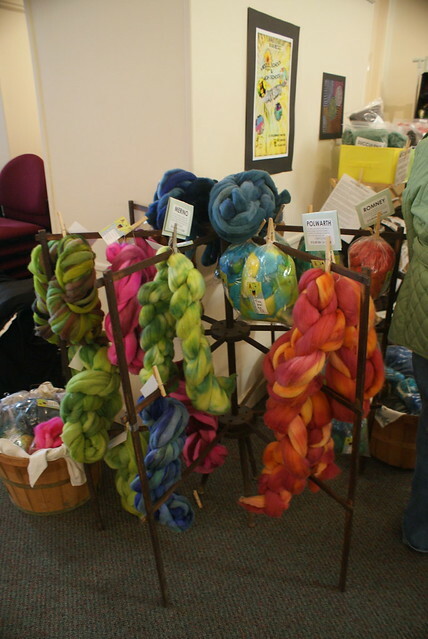 I also brought Cupcake Ranch fiber, a whole display of samplers and kits, luxury fibers, and the very popular Sock Sacks, specifically designed for spinning socks. The surplus will go up on etsy later this week. I always do something of a post-mortem after fairs (though, curiously, I seldom learn from my mistakes). Besides being late, which may be unavoidable for me, my biggest shortcoming was lack of a central supplies/signage bin. I packed my signs and supplies willy-nilly, so I didn’t realized I was missing a bunch of odds and ends until I needed them. That left me scrambling to find stuff and making a lot of stupid hand-printed signs. My printing is fine, but it brought down the unity of the booth and wasted a lot of my time. This isn’t the first time I’ve suffered from this particular error. But it will be my last. This week, while I’m unpacking all my gear, I’m going to follow through and replace all of my hasty last-minute signs with nice printed ones to match all the others. I packed up most of those signs with my stuff, so it will be easy to track what I was missing. I’d also like to make a few informational displays (different fibers and preps and what they’re best for). Then I’m going to pack all of them, along with bags, pens, my booth apron, and a master check-list, in a special booth bin, which I can just squirrel away with my new dryer rack bins and cubbies, until the next event. Ta da! Look at me, actually learning from my mistakes! 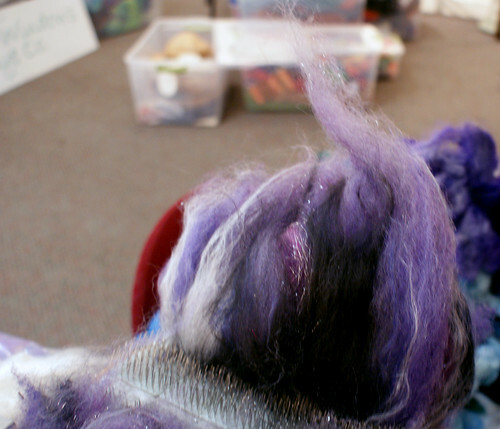 I also plan to add a natural wool/alpaca batt to my demo repertoire, since a lot of people do grown their own fiber and don’t know exactly what to do with it. But all in all, I had a great time with almost zero stress, and met a hoard of wonderful people. Yay, Woolfest! 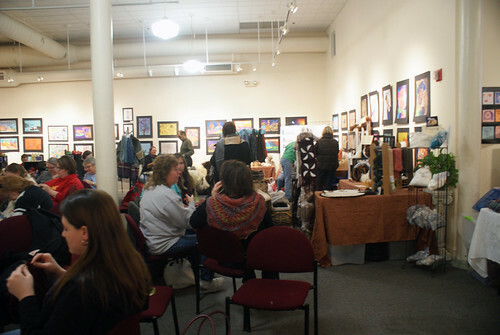 Don’t cha just love it that little ole Wamego can pull off such a lovely event! I forgot my camera and didn”t get to shop until the very end when folks were breaking down. It was a feast for one’s eyes in the dead of winter though. I feel blessed to have this good energy in the area. Thank you so much for having such a wonderful booth at the fair. This was my first year attending and had a wonderful time. I LOVE how you market things. Brilliant! The sock sacks were ingenious. 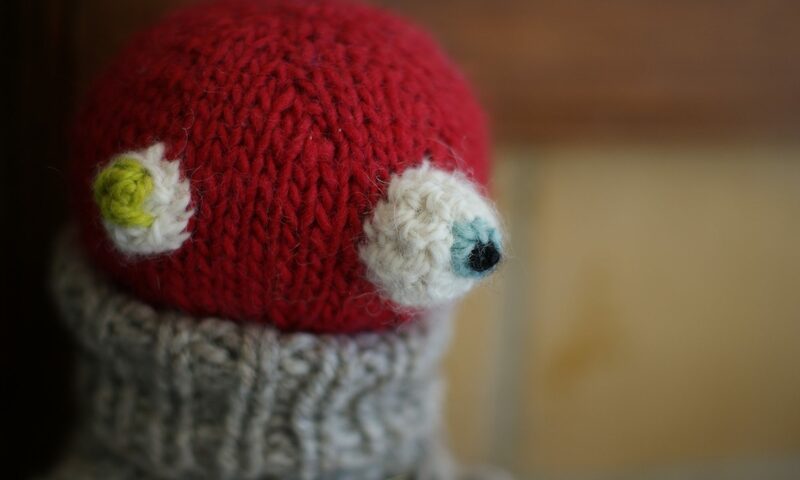 I just started knitting a year ago and spinning this past summer. I’m still a newbie, but completely obsessed! Thank you for having such a fun booth. I hope to someday get to the Harveyville Project before it sells out. Previous PostPrevious Oh, Linen Stitch, I can’t say mad at you!